FACT CHECK: Can TV Viewers Protest Donald Trump's Inauguration by Changing the Channel? Can TV Viewers Protest Donald Trump’s Inauguration by Changing the Channel? A Facebook message urges viewers not to watch Donald Trump's inauguration, but that form of protest likely won't affect the event's ratings. Television viewers can drastically lower the TV ratings for Donald Trump's inauguration by changing the channel. 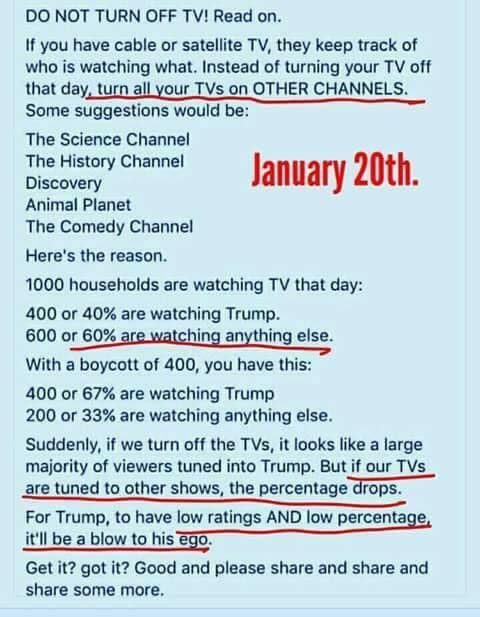 However, a boycott scheme similar to the described above would likely not be very effective regardless if whether viewers had their televisions turned on, off, or changed to something other than Inauguration Day news coverage. Chosen at random through proven methodology, Nielsen’s U.S. TV families represent a cross-section of representative homes throughout the country. We measure viewing using our national and local people meters, which capture information about what’s being viewed and when, and in the major U.S. markets, specifically who and how many people are watching. We also have TV set meters in many local markets, and we collect more than two million paper diaries from audiences across the country each year during “sweeps” — specific periods during the months of February, May, July and November. To measure video content viewed on mobile devices, we have expanded our panels to incorporate census-style data from third parties in order to capture the breadth and depth of consumer usage. “It’s a very select few,” explains Jon Gibs, Nielsen’s senior vice president for analytics and insights. “The reason these people are picked is because they are representative of a broader population.” The company goes to great lengths to make sure that each household chosen to be among the 25,000 Nielsen households stands for a large number of other people. “We make sure that our TV households maintain what we’d consider sort of normal behavior,” and people are warned against changing their viewing habits just to make a particular show popular. Since Nielsen uses these selected families to determine television ratings, the viewing habits of most people (who are not members of a Nielsen family) go largely unrecorded. (A): The short answer is no. And the long answer is nooooooooo, your TV vote doesn’t count in any meaningful way unless you’re a Nielsen family, in which case you affect ratings. And ratings are what count. 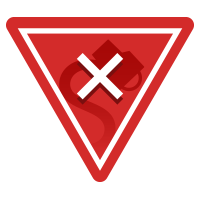 The various fan ephemera does not have a big or clear impact on keep/cancel decisions. The households are evenly distributed by population throughout the United States, and are roughly meant to be representative of the population as a whole. They also rotate occasionally. But let’s get back to that number. Maybe 50,000 households seems like a lot to you, but to put it in perspective, there are approximately 100 million households with a TV in the United States. That means even at the high estimate of 50,000 households, the number represents .05% of the households. That would be less than 1/10 of 1%. The ratings that you see — for cable news, for broadcast primetime shows, etc — are then extrapolated out from these Nielsen households. So in this scenario, each household represents 2,000 other households in approximating what the country is watching. “For 66 years, New York-based Nielsen has calculated viewership numbers. Set top box data is especially helpful in small markets where the sample sizes for Nielsen’s surveys often are too small to give advertisers a clear sense of what niches of viewers watch. So it’s not surprising that Nielsen will begin by blending the Dish data into reports for all 210 markets in its its Local TV Measurement service. The ratings company also will use the results in other products including Nielsen Scarborough, Nielsen Data Fusion, and Nielsen Media Custom Insights. As Nielsen’s data is largely drawn from “Nielsen families,” a non-Nielsen family member’s individual viewing (or lack thereof) of Donald Trump’s inauguration would have virtually no impact on the event’s overall television ratings. Fast Company. 22 March 2015. Indianapolis Business Journal. 15 October 2016.